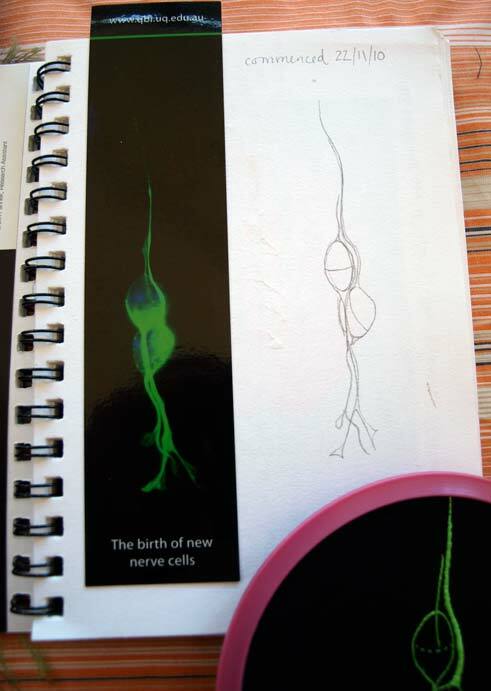 I had a couple of hours to spare in the Culture at Work studio this week, so I began another embroidery I've had in mind for a while, based on an image of cell birth that appears on a Queensland Brain Institute bookmark. The neurons, with their tendrils stretching out to make new connections, look rather sperm-like, which is appropriate when we're talking about the birth of brain cells. What will they develop into as they grow and age? What thoughts will pass along those tendrils? The beautiful blue and green fluorescent markers used to reveal the cell structures are a lovely colour combination. 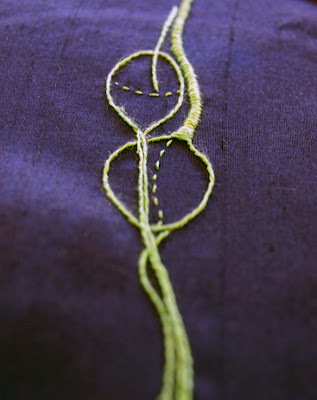 The thread I'm using is hand-dyed stranded cotton, and the whole work will be in padded satin stitch when it's done; at the moment I'm just working the outlines in outline stitch (I've satin stitched one tendril at the top of the image below).